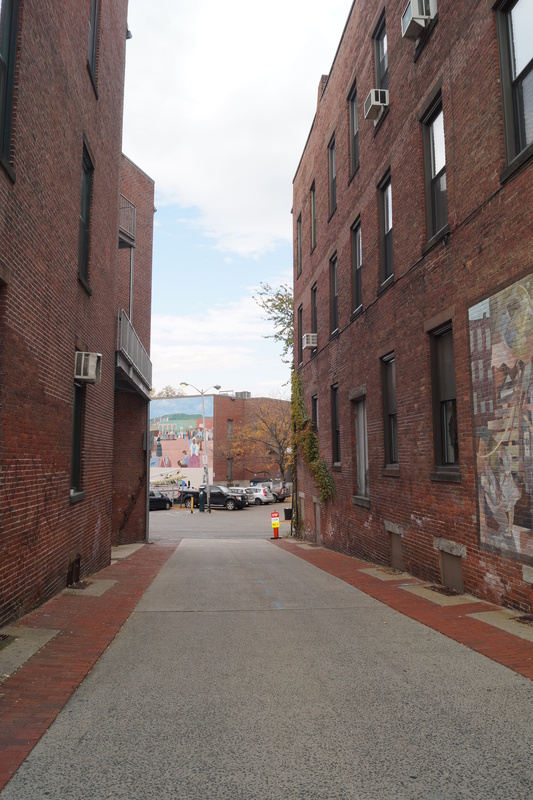 A few more pictures from our visit to New England a few weeks ago…this time focusing on Northampton. Our road trips in 1987-88 often included a stop or two down here. I obviously gravitated towards the record stores and sometimes the book stores, but there were also quite a few excellent restaurants here as well. It’s still one of my favorite places to go when we’re in the area. I would not mind living here either, if it were not for the fact that we’d have to deal with snowy winters! Here’s a panoramic shot of part of downtown Northampton, as seen from across the street in front of City Hall. That alleyway is Cracker Barrel Alley. We used to park in the lot back there during our trips to Main Street Music, which is where Village Salon on Main is now, to the left of Starbucks. Here’s another view of the Alleyway. Cracker Barrel Alley…many an evening clutching my latest record purchases while walking here. A few reasons I show this. On our trips to MSM, there was many a night’s end when we’d be walking down this alleyway and back to the car, clutching our latest spoils and already planning when we’d borrow them for further dubbing. In fact, after our shopping we’d often hang here for a good half hour, talking about all sorts of things before we had to head back home. It has not changed one bit, maybe aside from the repaving. Second? See that building in the background? That community-themed mural has been there for decades (and touched-up here and there), at least since the 80s. But the important part was that boring little brick wall around the corner from it. About two stories up, someone sometime in the early 80s spraypainted the word ‘ANARCY‘ in large black letters. No idea how they got up there, and I don’t think anyone fessed up to it, either. But promoting anarchy to the point that you deliberately spell it wrong? We loved that idea! It fit in with our 80s small-town nonconformist ideals quite nicely. I think it stayed up there at least until the early 90s when it was finally powerwashed off, but I’m sure most Smithies and other Five College kids from that era will remember and cherish that tag. 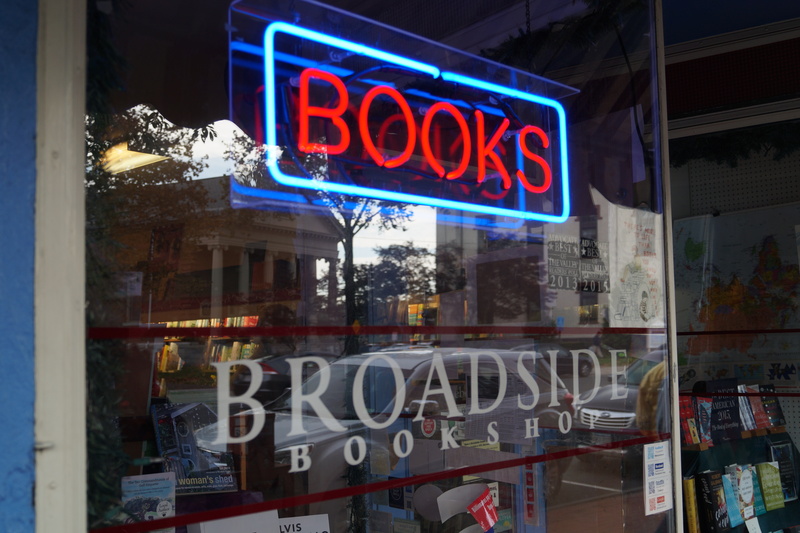 Broadside Books, a fiercely indie bookstore that would make City Lights proud. …which not only is still open, but still looks the same after all these years! This indie has always been a mix of commercial, obscure, and political since 1974. 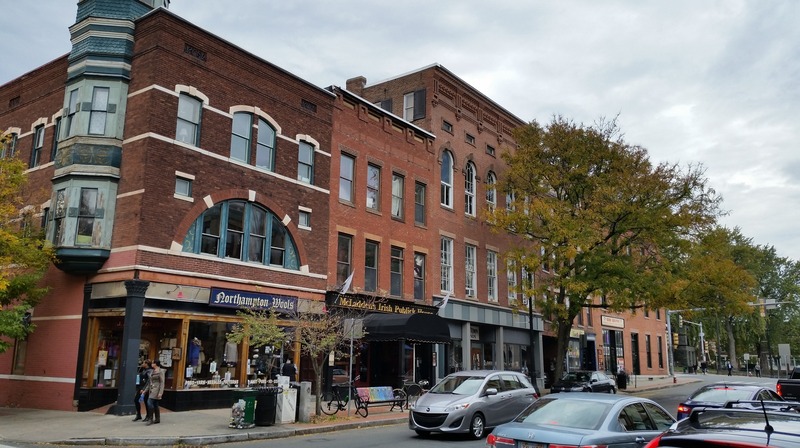 It’s a quintessentially New England type of indie, a community-first type of store that offers the bestsellers alongside books on grassroots politics and local history. Faces, where many 80s rock pins for my denim jacket were purchased. Ah, Faces! It opened here in 1986 during the high point of that decade’s fashion, and catered to all kinds of ridiculousness. This was your one-stop shop for dayglo clothing, fun printed tee-shirts, whoopee cushions, fake poop, posters (album, band, and black-light), disposable dorm and apartment furniture and accessories (in their huge basement), and anything else to make your college life California flashy in an otherwise drab New England. And also where I bought a crapton of those pins you might remember seeing on denim jackets in that decade. I usually went for the rock band logos, album covers, and the occasional silly jokey ones (‘I’m not weird, everyone else is!’). It very nearly closed recently, but since it’s so beloved by students and locals alike, someone bought it from the original owner and it’s still alive and well. Thornes Marketplace Building and environs, including a boot shop next door that I believe is older than me! 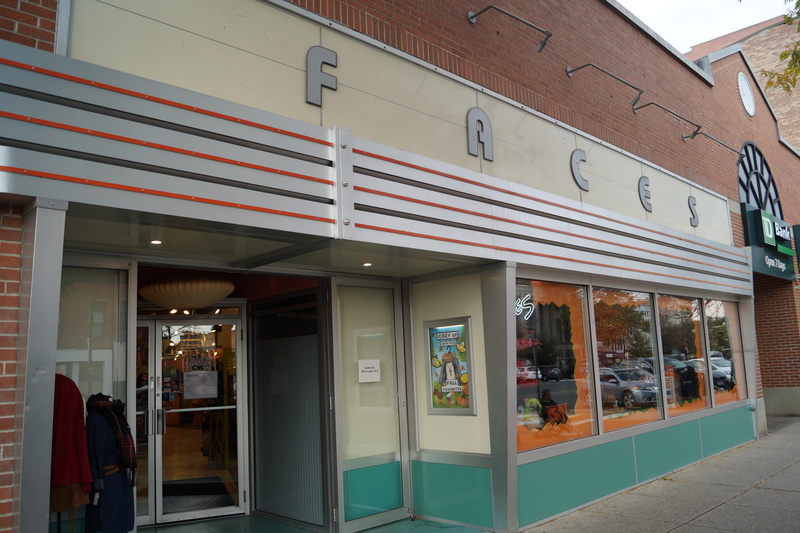 Just across the way from Faces is another hangout, Thornes Marketplace. Their website states it took over the site of the old McCallum’s Department store in the mid 70s and by 1977 or so it got its present name and has been an indoor shopping experience ever since. There are stores of varying shapes and sizes, from clothing boutiques to kitchen accessories and even an Acme Surplus in the basement! Speaking of which, way down in the sub-basement (back parking lot level) was a huge used record store called Dynamite Records. It didn’t so much cater to hard-to-find obscurities as it did those albums you never got around to picking up when they were new, or that one record you’re missing from some band’s discography. This was a bit later on, I believe, maybe in the early 90s and into the early 00s, as I spent many an afternoon beefing up my back catalog with their selection. OH! 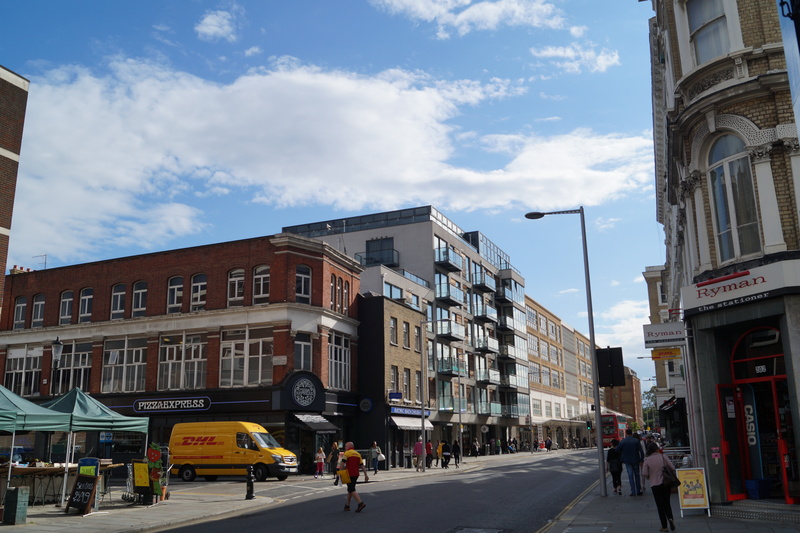 Yes, and just around the corner on that side street to the right (Old Street) is Herrell’s Ice Cream, quite possibly one of the best local ice cream parlors in the area. This little strip at the head of Pleasant Street has changed a bit over the years. Northampton Wools is where Pleasant Street Video used to be for decades (said to be one of the best local rental places in town, and had quite the collection of popular and obscure titles). McLadden’s Irish Pub has taken place of the former Pleasant Street Theatre, where all kinds of indie and low-budget movies would be shown. I never went there until the mid-90s, but I did get to see quite a few great films there. Their basement screening room was so tiny and oddly shaped, the first two rows had 3 seats on either side. Further up is another record store I’d frequent in the 90s called Turn It Up! Records, down in a musty basement. I usually went here for used cds, as their dollar bins were quite choice. They’re still there, I believe! One last thing I want to post here…it’s another ‘no longer there’ Google Maps embed, but it’s kind of important, at least to me! It’s one of the stores in the strip mall on King Street, north of the town center, right near I-91. This is the storefront where Northampton Newsroom used to be, back in the 70s and 80s (and I believe into the early 90s). It was your small WaldenBooks-style store with a selection of genres, a wide selection of newspapers and magazines, as well as candy, gifts and more. I mention this place because in late 1984 during one of our family shopping trips down to the Valley, I bought a book here called Dragon Fall by Lee J Hindle. 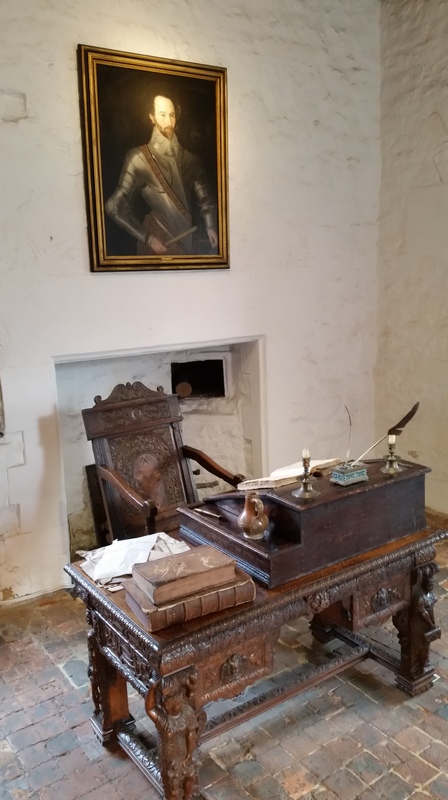 It was the first winner of a YA writer contest for its publisher, and when I heard a teen had written it, a light bulb went off: hey, I could do this too! I’d written some stories here and there that didn’t go anywhere, but after seeing this, there was no helping it…I had to be a writer too. I started writing the Infamous War Novel in earnest and never looked back. Our vacation was fruitful on many different levels, and I was able to fill in a lot of the gaps for my Walk in Silence photo database. Here’s the first of a few posts focusing on various points of interest related to the 1986-1989 timeline of the book. Hope you enjoy! I used to catch the school bus from that intersection. Imagine a surly teen waiting for the moment he could pop on his headphones and blot out the inane conversations going on around him. Usual soundtrack: The Smiths or Depeche Mode. 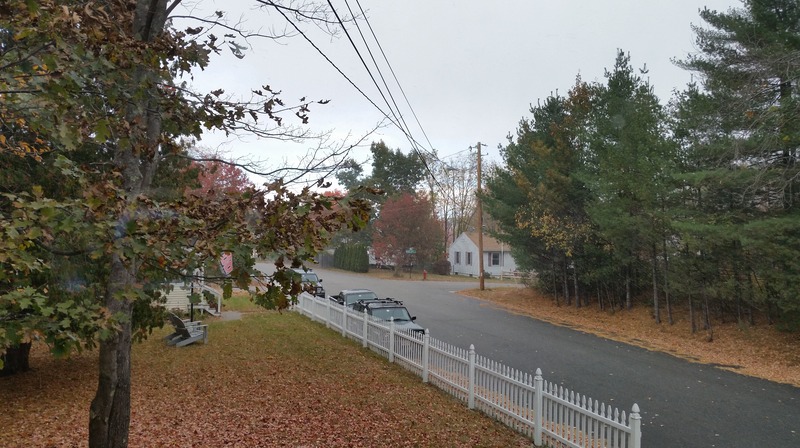 This was taken from the front room of my parents’ house, looking up the street. If this picture looks a little streaky to you, it should — that was a minor five-minute flurry of snow that fell not an hour after we arrived! 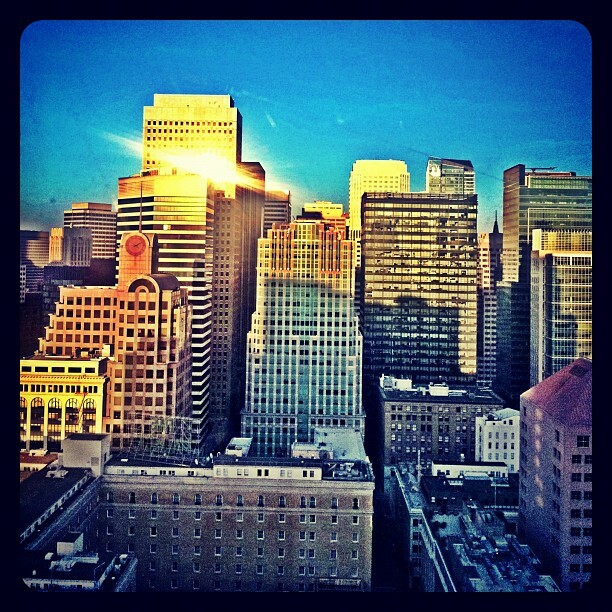 But yes, this was similar to the view from my bedroom window looking north, where my desk was. It never felt like the edge of the world, but more like a hideaway from it. I spent a lot of time there, listening to WMUA or WAMH (or one of my many tapes or records) while doing homework, writing, or reading. My high school, which hasn’t really changed that much at all over the years. A lot of memories of walking through these halls. I still remember my locker number (103, Lower C hallway, just outside Mr. Jolly’s room). My house was two and a half miles from here, so I took the bus (#312) and tried to avoid everyone that annoyed me. The ride took just shy of twenty or so minutes, due to traffic and a few further stops, so I could listen to at least three or four songs on my Walkman before we got there. 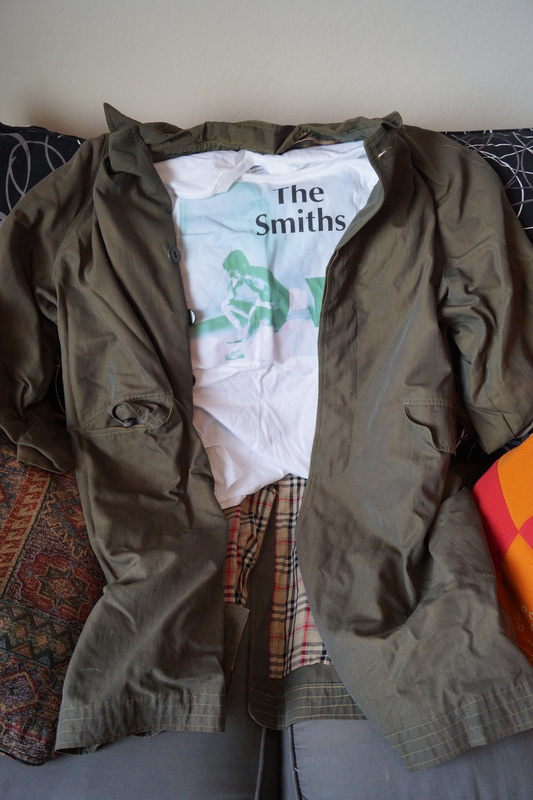 Not the originals — the first duster and Smiths tee both bit the dust from overwear by 1990. Duster 2 was given to me from a high school friend around that time, and I found the Smiths tee on eBay last year. A tatty green duster (my grandfather’s) and a tee shirt showing the cover of the “William, It Was Really Nothing” single (bought at MSM and cherished as one of my favorites) was all I needed to wear to show my unique weirdness — no need for mohawks or nose piercings in my small town, not when I was already known as the resident college rock geek. On our recent trip we also made a point to stop in Amherst and Northampton on one of the days, for varying reasons. One was to meet up with a few friends from the area, but it was also to revisit some of our old haunts. I’d been heading down that area since the early 80s when my family would shop at the malls down in Hadley; A. is a Smithie from the early 90s and knows the area as well. The Five College area is one of my favorite places in the state. In high school my friends and I would frequent this area all the time, hanging out not just at the mall but on the commons and in the various stores and cafés, talking and laughing and listening to great music. 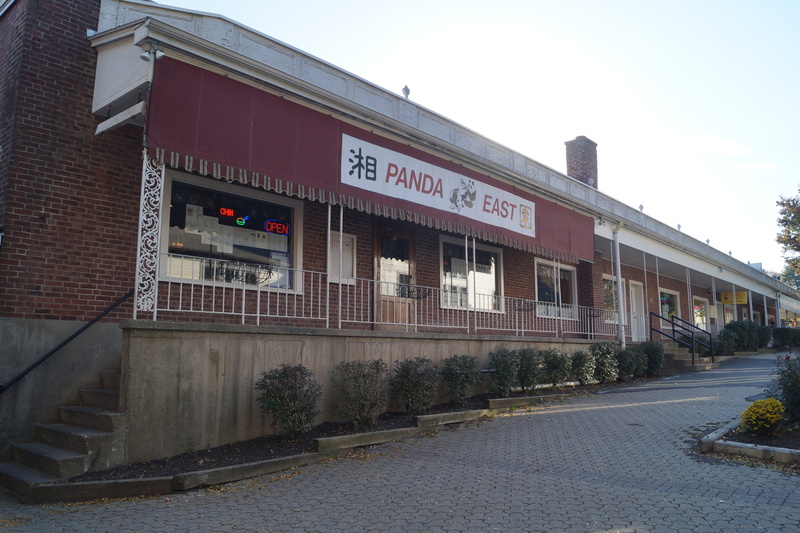 Panda East was a Chinese restaurant we used to frequent back in 1987-88 (and yes, I am a bit surprised that it’s still there after all these years), often for dinner before or after we did our shopping or going to a movie. After we ate we’d hang out in this little courtyard in the foreground and talk about all sorts of things. I remember listening in on a conversation about college plans and silently wishing I could be a part of it. Alas, I had one more year to go. 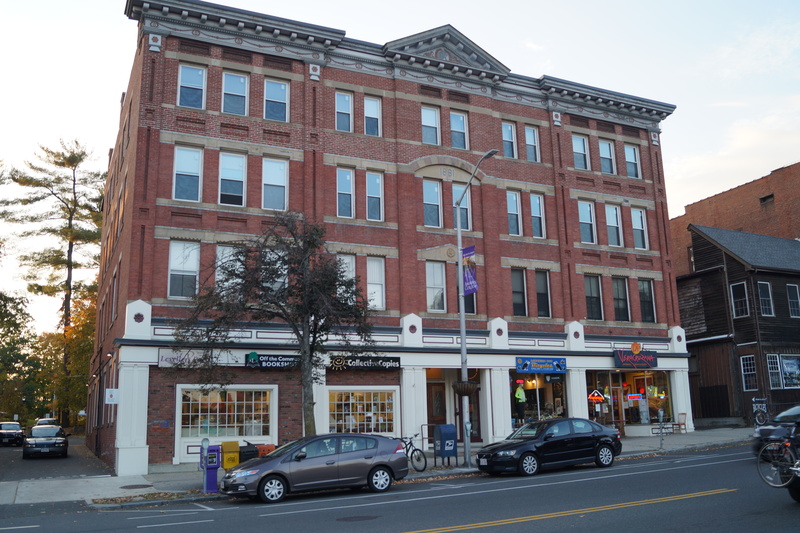 Almost directly across from Spring Street on the common was a café called Bonducci’s. It was where that Veracruzana Mexican restaurant is now, in that right corner spot. It was your typical collegiate café that served coffee, sodas (I always used to buy the Snapple vanilla creme, back when they used to make sodas) and pastries. This was often our last stop of the night, but it was also where we’d often have the more serious conversations. Some of us would trade gossip, others would talk about philosophy (as one did when we tried to pretend we were being all deep and academic). I would often be the one to initiate the conversations about music, of course. That corner spot where Zanna is now, used to be where Al Bum’s was back in the 80s (and I think into the very early 90s). My dad brought me here probably around 1985 or 1986, as it was one of the few record stores I knew of that carried Beatles bootlegs. A year later when I discovered college radio, it became an important and expected stop for finding the punk, college rock and industrial sounds that I couldn’t find at the malls or department stores. When my friends and I headed down here, we’d almost always stop for an hour or two and dig through the bins. Al Bum’s played a significant part in my music collecting during that time; what I didn’t buy at Main Street Music in Noho, I bought there, with a very minor percentage bought at the music stores at the Hampshire Mall. Lastly, a picture from our trip back in 2012. 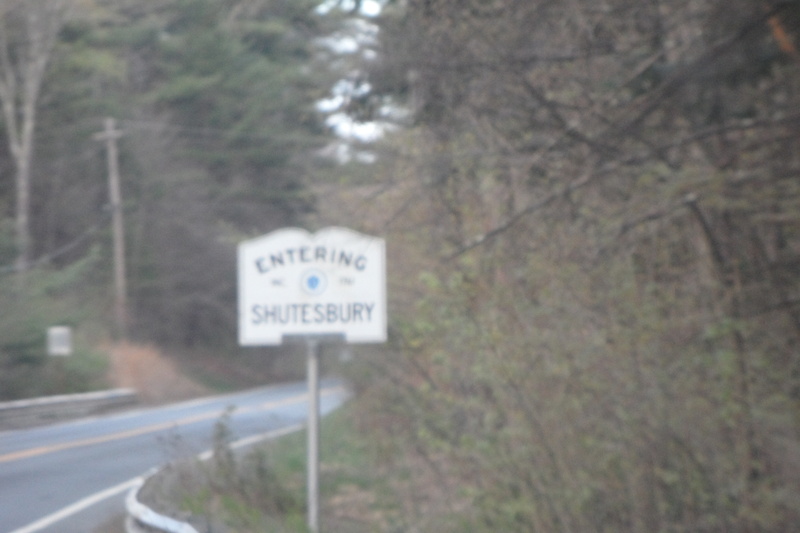 There’s a stretch of Route 202 in New Salem that cuts through a tiny corner of Shutesbury for a few hundred feet before popping back in. I was always amused by this little bit of ten-second town-hopping, and sometime around 1985 or so I got into the habit of holding my breath between the two town signs. I got all my friends to do the same, so when we headed back home from an afternoon or evening from the Valley area, we’d always do this. Thirty years on and I still do it every time I come back and visit. Coming Up: Views of Northampton and maybe a bit of Boston as well! Trafalgar. 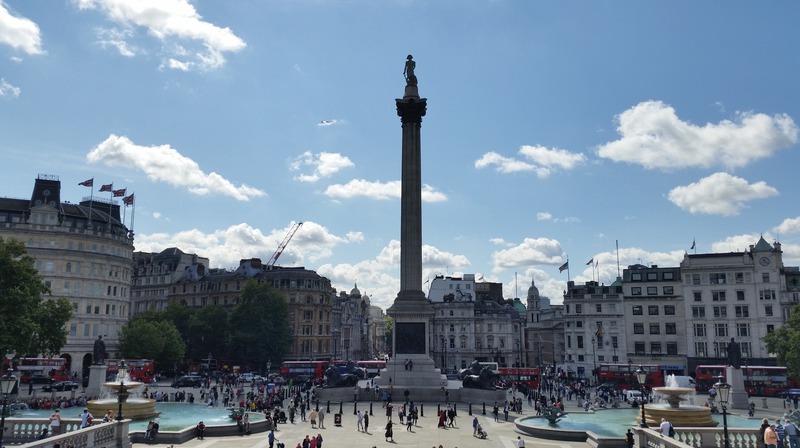 Trafalgar Square is a lovely open area with tons of walking space and views, and a short walk from many other things to see. This was taken from the steps of the National Gallery looking southwest–basically looking at Nelson’s back. Piccadilly Palare. 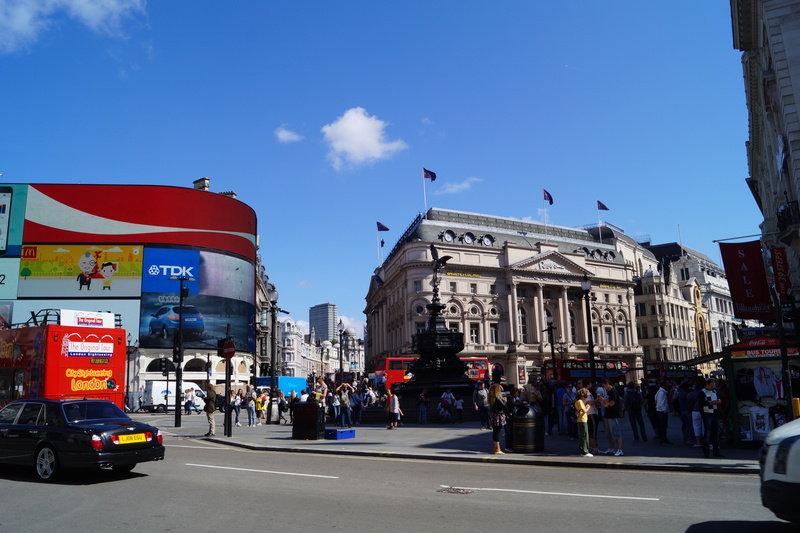 Piccadilly Circus is right up the street from Trafalgar Square, and let me tell you, it’s a complete mess as far as foot and car traffic is concerned. 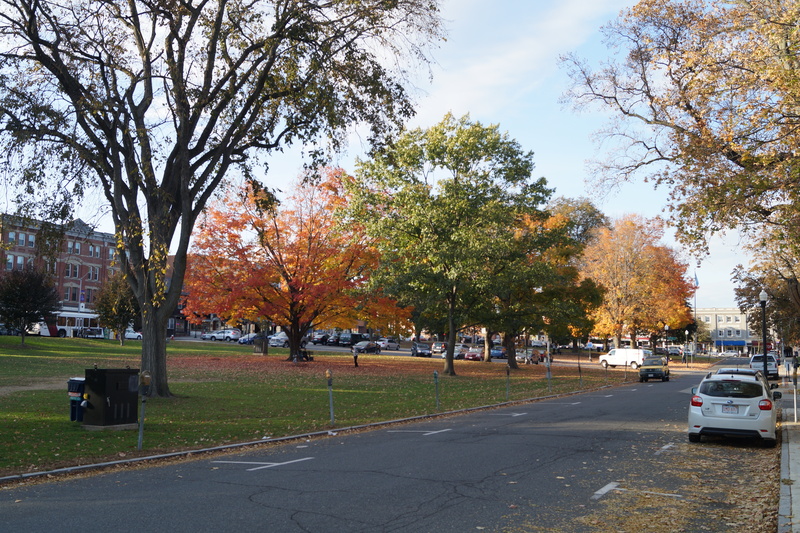 [For my Boston friends–think the worst parts of Harvard and Kenmore Squares, multiplied. For the rest of you, think a smaller but equally tourist-heavy Times Square.] The plus side is that there’s a ginormous Waterstones Bookstore there that’s worth getting lost in. St Martin in the Fields. Okay, it’s not exactly a lyric or Britpop reference, but any classical section of a record store worth its salt sells releases either recorded in this church or by its Academy. 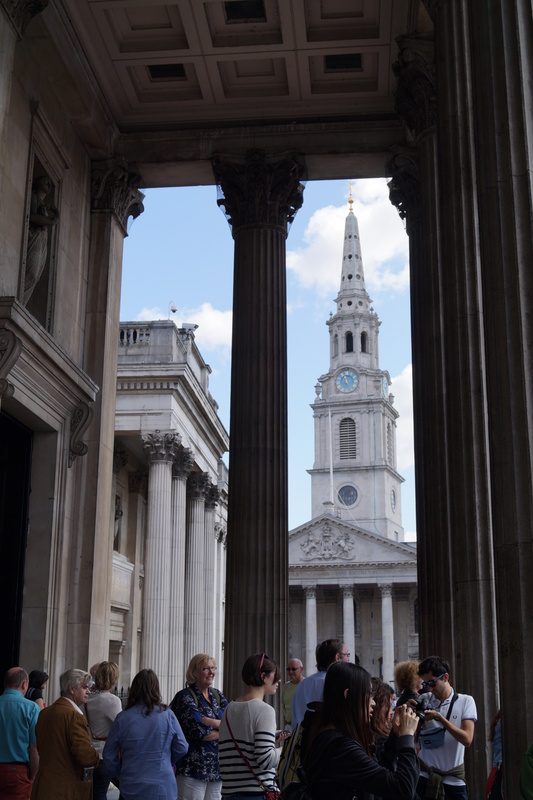 Taken from the same portico where I took the Trafalgar Square picture. It’s actually pretty amazing how many famous locations are in this spot–the National Portrait Gallery is around the corner, the theater district on the Strand is up the street, as is Whitehall Street, 10 Downing Street, Big Ben, and Westminster Abbey. You can easily hit all these stops in a half a day like we did. 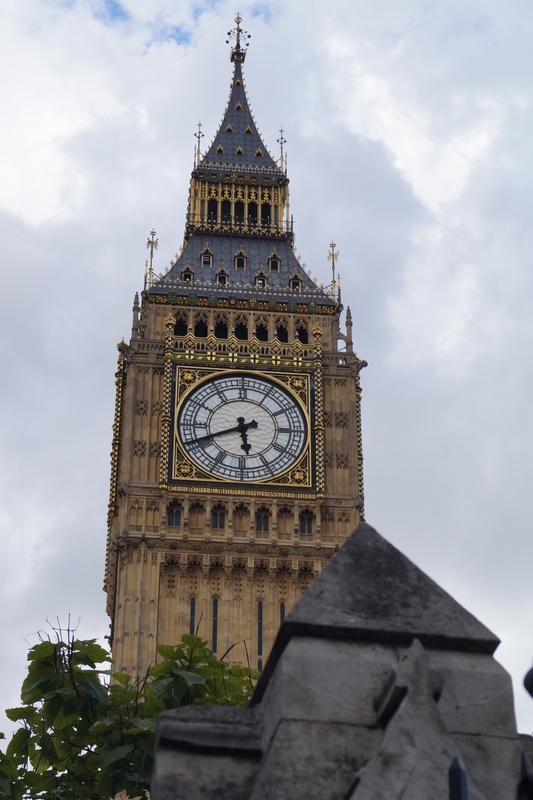 Big Ben. Walking down Whitehall, it’s kind of interesting to come across the House of Commons because you’re busy looking at all the other government buildings in the area, when suddenly you’re at Parliament Square and OH HEY there’s all the famous buildings! The House of Commons itself is quite impressive in its Gothicness, and the clock tower makes its presence known as soon as you turn the corner onto Bridge Street. And yes, I did hear the chimes as we were walking down the street. Big Ben’s pretty damn loud, actually. (I Don’t Want to Go to) Chelsea. Actually, I do! Chelsea’s a little neighborhood right down the road from Kensington/Earl’s Court and was a lovely little area with many things to see and do. And we happened upon the football club grounds completely by accident! More pictures and tunage soon! I promise I won’t take nearly as long to post next time! 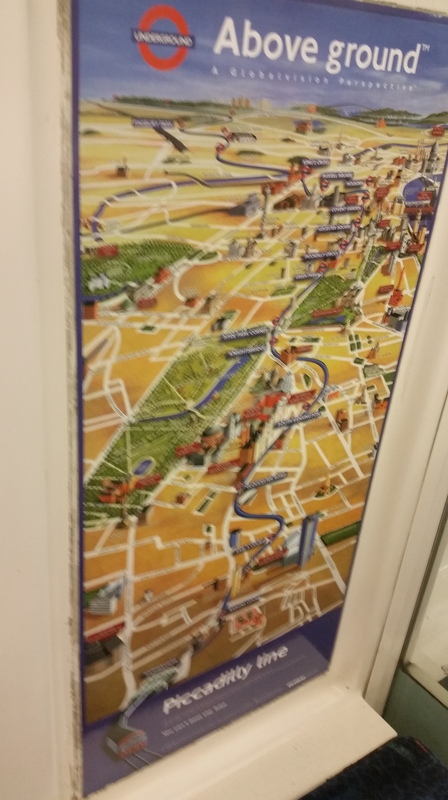 If you happen to follow my twitter feed, you may have noticed a run of pictures I posted during our London trip with the hashtag #joncsbritpopmeme, in which I took pictures hinting at certain songs with a distinctively British pop history. Here’s a slightly updated/’remastered’ version of the pictures…click on the thumbnails to embiggen the pictures. Enjoy! Going Underground. 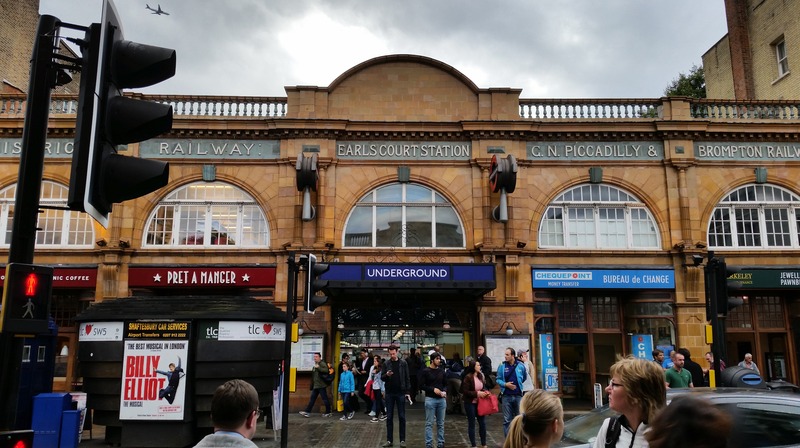 Within an hour of landing at Heathrow we jumped on the Piccadilly Line to head out to our destination. 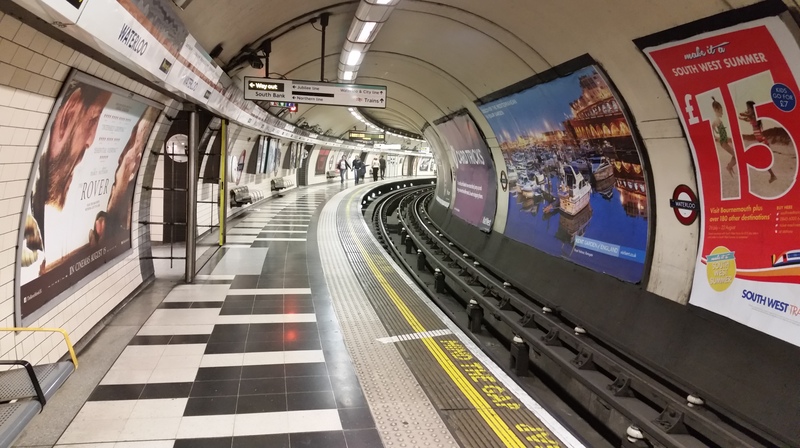 My first reaction to the Underground was that it was remarkably like the MBTA in Boston, with its color-coded lines and specific neighborhood stops. I pretty much grokked the transportation bit right away. Victoria. 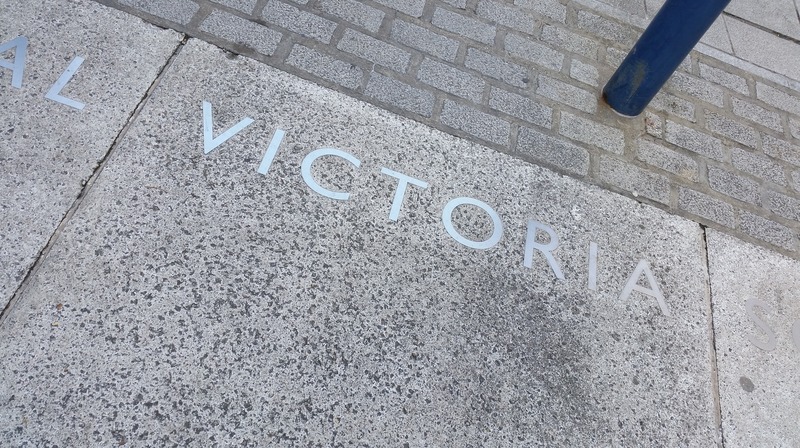 The ExCel London is on Victoria Dock, right alongside the Thames, a few miles outside of the town proper. It’s a lovely area, even if there was quite a bit of construction going on. The Metro. 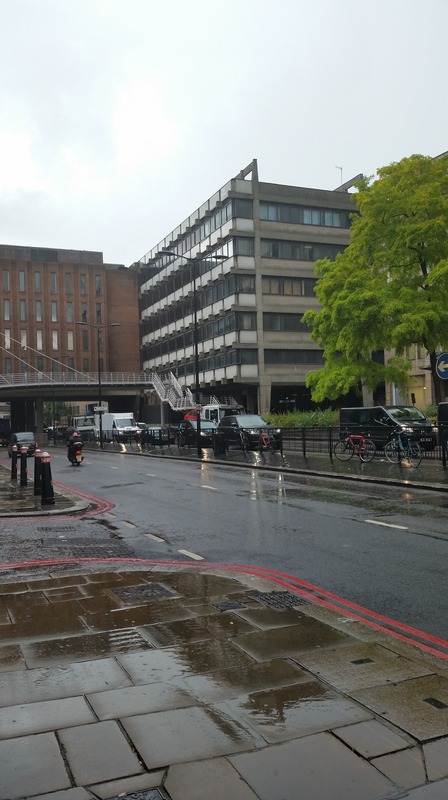 The weather in London was pretty wacky, even to our Bay Area standards! Clear day, only to rain heavily for about ten minutes, and then clear up again. The Lumberjack Song. 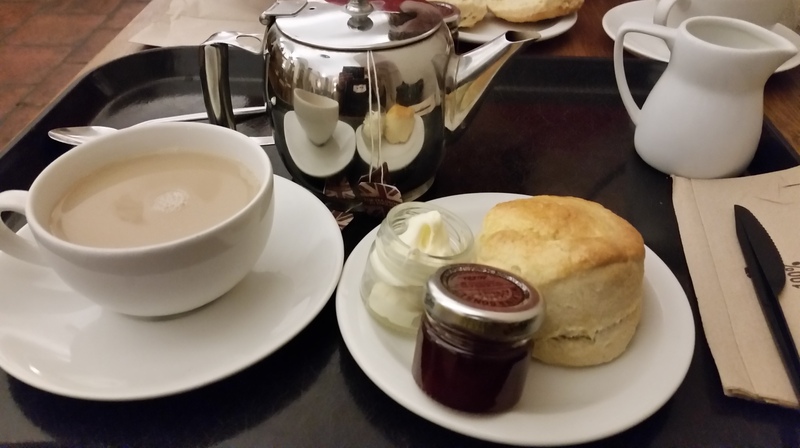 Okay, technically it was Monday and these were scones with clotted cream (yum!!) but it was tea in the basement of St Paul’s Cathedral. It’s where I discovered Tregothnan is my favorite brand of tea right now. Millennium. 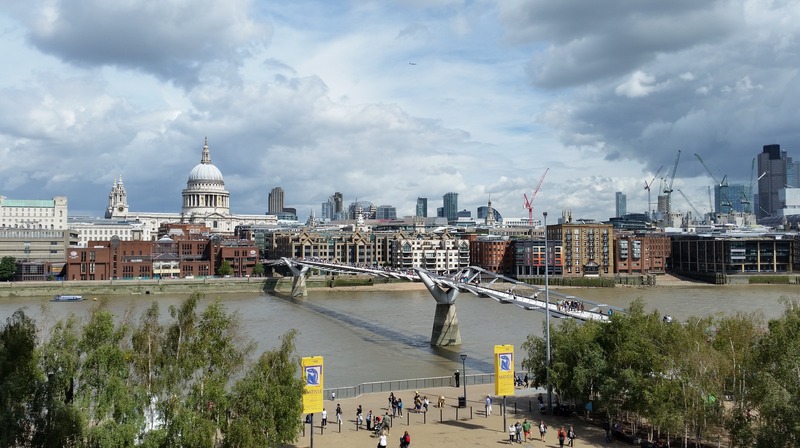 A lovely view of the bridge from an upper deck of the Tate Modern. It spans from this arty little neighborhood over to the center of town where St Paul’s is. You may remember this bridge being destroyed in one of the Harry Potter films. The Globe. 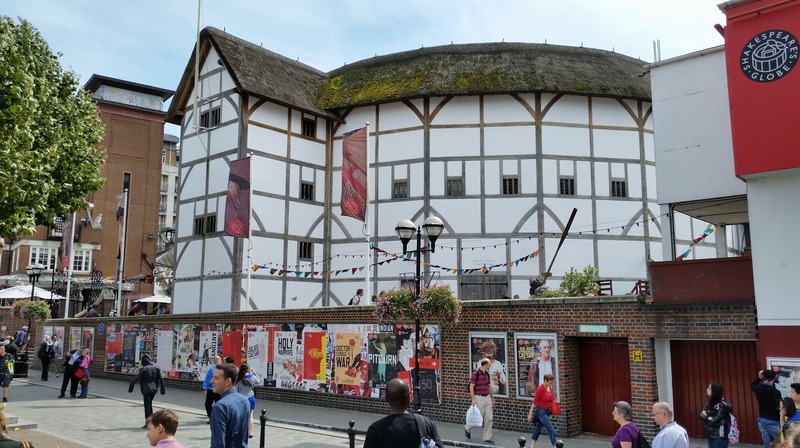 The Globe Theatre–not the original, of course–is right on the shore of the Thames, in an area that definitely reminded me of Pier 39 here in San Francisco…lots of touristy shininess. Down in the Tubestation at Midnight. In the Waterloo station, waiting for the line to bring us back to our hotel. Loved the tilework on most of these stops, especially the older ones where the “way out” exit signs were inlaid against the walls. Parklife. 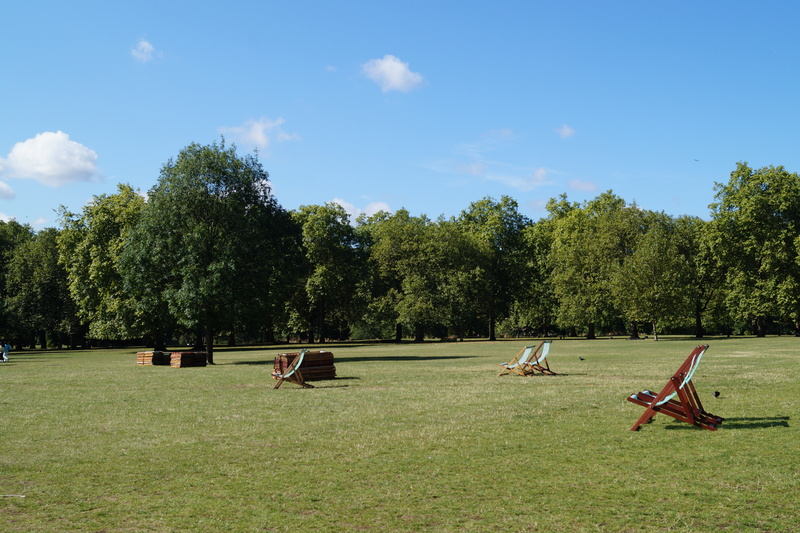 An idyllic scene in Green Park, strolling from the Piccadilly line stop over to Buckingham Palace. It was a gorgeous day for sitting on the grass and relaxing in the sun. The Queen Is Dead. For the record, I did not have a sponge or a rusty spanner on me. Buckingham Palace is quite flash, and definitely a tourist attraction. Didn’t see the Queen Mum, however. Oh well! Get Back. 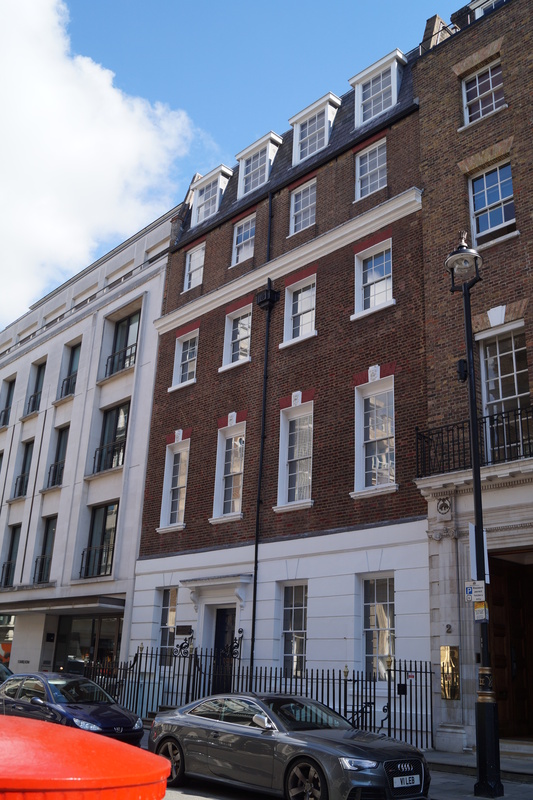 3 Savile Row, the former Apple Corps office. The famous rooftop concert at the climax of the Let It Be film took place here, and many of the studio recordings for that album took place in its basement studio. It’s an investments office now, but you can see a few “thank you Beatles” scribbles on its doorframe.